Introduction: This analysis is part 1 of 2 that seeks to conclude in a detailed trend forecast for UK house prices that extends my existing forecast into Mid 2014 to the end of 2018, thus a 5 year forecast for UK house prices 2014-2018. This analysis is focused on the outlook for the UK economy, debt and QE money printing dynamics and their implications for UK house prices and on the outcome of the next general election. Note: Part 2 can be accessed immediately via the link towards the end of this article. The Coalition Governments increasing measures aimed at igniting an accelerating election economic boom have been starting to materialise in the official economic statistics as illustrated by the recent announcement of a jump in UK GDP for 2013 Q3 to 0.8%, which prompted the governments OBR to revise year on year growth forecast to 1.4% (0.6%) for 2013 and to 2.4% (1.8%) for 2014, with these revisions being representative of most academic economists as they converge towards a consensus view. The current phase for accelerating economic growth follows an over 5 year long effort since the depths of the Great Depression of 2008-2009 for the economy to attempt to claw its way back out of the deep black hole that the Labour government had left it in and that has still to return to the level where it stood at its 2008 peak that it will now likely achieve during late 2014. Depending on what measure of GDP one takes, the UK economy still remains between 2% to 3% below its GDP peak. The measure of GDP that I track is ABMI chain linked change on the year earlier currently puts UK GDP at -2.5% below its 2008 Q2 peak. 31 Dec 2009 - UK Economy GDP Growth Forecast 2010 and 2011, The Stealth Election Boom ) update following the June Emergency Budget that resulted in a revision only for the 2011 from +2.3% to +1.3% (09 Aug 2010 - UK Economy GDP Growth Forecast 2010 to 2015). Original GDP Growth Forecast Graph. 1. That the post economic collapse economic recovery into Q3 2012 turned out to be significantly weaker than expected which resulted in what I classed as an embryonic UK housing bull market that persisted for virtually the whole of 2012 as academic economists constantly speculated on whether or not the UK would enter a double dip recession. 2. The subsequent economic trend since Sept 2012 when George Osbourne finally succeeded in shifting gears for the housing market and thus sparking a multi year bull market following his then announcement to effectively double housing market permitted developments, since which time house price inflation momentum has continued to accelerate, having gone from -2% to now standing at +8.5%. Note the key point is the effect on SENTIMENT that has been driving housing market activity and not on WHEN works on extending properties would commence. The implications of UK house prices momentum and sentiment on the broader economy were covered extensively in my article of August 2013 as strong house prices momentum acts as a feedback loop hence the lag of a couple of quarters between GDP data and the house price indices. 19 Aug 2013 - UK House Prices Bull Market Soaring Momentum, 10% Inflation by October? The most recent UK GDP data for Q3 2013 jumping from 0.3% to 0.8% illustrates that the UK housing market momentum is fulfilling its primary objective for translating into accelerating economic momentum and that is where the true state of the economy and where the coalition governments electoral prospects lie and not in ivory tower based theoretectical models focused the great recession that has long since left the general populations collective memory. The general population having been conditioned by 5 years of economic depression is right at this moment in time starting to experience the feel good factor that encourages consumption and accelerates the velocity of money which even at the abysmally poor growth rate for 2013 of just 1.4% gives a strong indicator of what to expect going forward as the housing / economy feed back loop looks set to accelerate the rate of economic growth to far beyond the 2.4% rate for 2014 that the consensus has converged around, and the consequences it implies for perceptions of the state of the economy for the general population. As mentioned earlier this sea change in perception is already well underway, its just that its not going to be visible in the economic data for many months which is why the academic economists are once more caught on the hop where barely a few months ago the so called think tanks were busy downgrading Britain's growth prospects are now once more with the benefit of hindsight scrambling to upgrade to a rate of growth to around 2.5% for 2014, but they WILL ALWAYS remain well behind the curve because they do not understand the effect of market MOMENTUMN and SENTIMENT and that the UK economy is predominately a market economy. In terms my long standing growth forecast (as of Dec 2009), that concluded in a growth forecast for 2014 of 3.1% and peaking at a rate of 3.3% for Q2 of 2015. Instead, I now find myself not just contemplating GDP of more than 3%, but whether UK GDP growth by 2014 Q4 will exceed 4%! That illustrates how different an economic world the UK will be in in the lead up to the May 2015 election as today's 1.4% for 2013 will be a distant memory as the UK economy homes in on 4% GDP. The below graph illustrates my original forecast trend trajectory (03 Sep 2010 - UK House Prices and GDP Growth Trends Analysis ) for UK house prices against UK GDP Growth as of GDP Q2 2010 against the Halifax house price index for June 2010 of £166k, which at the time resulted in a over valuation reading of 37%. The forecast trend was for this measure to fall to 10% above GDP. Note this was not a forecast trend for UK house prices, but rather where this valuation index was expected to stand against the forecast trend for the UK economy IF UK house prices STAYED at their June 2010 level. Therefore house prices rising or falling would put the actual index higher or lower than indicated. The updated graph to 2013 Q3 GDP shows a marked turnaround in this indicator that bottomed at 21% at the beginning of 2013.
a. Contrary to many commentators / academics who imply that a house prices bull run is unsustainable because prices are already not too far off from their last bull market highs, however, in terms of valuation they are trading significantly below the bull market highs. b. Unlike the election bounce of 2010, this housing bull market is starting from a far lower base AND has greater time behind it which means that the trend will be supported all the way into the next general election that has the potential for sustainable momentum to have been built up that will be able to be sustained for many years beyond the next general election that ultimately targets a bull market bubble valuation peak far beyond that of August 2007 high, which coupled with GDP growth of above 3% will extend the trend for many years forward. Therefore this indicator heavily supports my longstanding expectations for the current UK housing bull market to last for the remainder of the whole of this decade, SIX YEARS! This may leave many confused as to why the UK economy could be soon growing so strongly, the answer lies in Britain's debt trajectory that pre-dates the LAST general election. George Osbourne recently stated that he now expects the UK budget deficit to magically turn into a surplus by 2018 (current £75 billion deficit). However as is usually the case we need a mountain sized pinch of salt to take with the utterances from politicians and their economic propaganda mouth pieces such as the OBR and the Bank of England that are paid by the state to publish what amounts to nothing more than economic propaganda such as that of the Bank of England's perpetual mantra that UK Inflation will converge to 2% in 2 years time which it misses over 90% of the time! Leaving aside the political trick of politicians trying to hood wink the voters by statements such as implying that paying somehow reducing the deficit is somehow the same as reducing the debt whilst the truth is that the debt is NEVER REPAID, instead here is a reminder of what the George Osbourne's OBR budget deficit forecast made right at the beginning of the Coalition governments term in office (June 2010) that stated that the UK deficit would be cut to £20 billion by the time of the next election which as I stated at the time was not going to happen as my analysis at that time concluded that the coalition rather than reducing the deficit would go on an extended borrowing spree as they attempted to ignite a debt fueled economic recovery into the Mid 2015 general election. The following updated graph for UK public sector net debt clearly shows that the UK government has hit a deficit cutting road block because instead of the deficit falling to around £60 billion for 2013-14, the government will be luckily if the deficit comes in at under £100 billion. Furthermore the trend for persistently high deficits is expected to continue all the way into the May 2015 general election as the Coalition government further ramps up deficit spending to buy votes, therefore there is a high probability that the deficit could yet expand further, the net effect of which would be for a total additional debt of over £130 billion beyond the governments expectations to be added to Britain's debt mountain. The policy of QQE has subsequently been seen to be made manifest as illustrated by a series of announcements that the Bank of England has in total transferred about £50 billion in interest received form the government back to the UK Treasury, which is then used as income to finance further government spending. The effect of this is to make it very problematic in forecasting official debt to GDP because as of writing we do not know the timings and amounts of such 'windfalls'. However, in all probability the UK Government will eventually start to follow the example of US and Japan and seek quarterly 'windfall' payments which amount to approx £12billion a year and will increase inline with future QE debt monetization. The long term consequences of this is to neutralise the impact of future interest rate rises that academic economists obsess over. To date the Bank of England has monetized government debt to the tune of approx £400 billion (33%) of the total debt mountain that currently stands at £1.22 billion in perpetuity, because the monetized debt will never be repaid but constantly rolled over and left for inflation to do its job by eroding away its value. The effect of this is as I have illustrated above that the government is thus currently paying itself interest on approx 1/3rd of its own debt which effectively means that the Bank of England has cancelled 1/3rd of Government debt to date, this despite it continuing to officially exist in terms of debt statistics, but to all intents and purposes it no longer has an impact on government finances which is why market interest rates remain low. Now before you start to wonder wow, 1/3rd of government debt as if by magic has now disappeared in a puff of smoke, you need to realise that the consequence of both QE and QQE is INFLATION, as the economic consequences of flooding the economy with printed money (government deficit spending) that is NOT been backed up by any productive activity. i.e, the money that the government is printing on the likes of the benefits bill, NHS black hole, and pensions have not been produced by anyone but rather conjured out of thin air, and without the market interest rate consequences by virtue of the Bank of England buying this flood of debt issuance i.e. taking it off the market, and effectively canceling it which is contributing to an accelerating exponential Inflation mega-trend that over time seeks to erode the value of all sterling debt. The rate of QE and related measures since March 2009 has averaged about £100 billion per year, which approximately covers the whole of the governments budget deficit and therefore ALL of the new debt that is being issued on an ongoing basis is effectively being systematically cancelled and there is no sign that this trend is going to end anytime soon, especially in the run up to the 2015 election as the Coalition government will increasingly attempt to buy votes with further money printing. The below Debt to GDP ratio graph illustrates the impact of QE to date, and QE going forward such as the Help to Buy Scheme of at least a further £12 billion per year to guaranteed loans of £100 billion into Mid 2016, and then coupled with the policy of QQE of effective debt cancellation that translates into a truer picture of Britain's public debt burden that also takes into account the inflationary consequences in terms of inflating GDP that depresses debt to GDP. The above in a nutshell singularly acts to condense down the impact of QE, QQE and Inflation on Britain's actual government debt burden that blows apart ALL of the academic economic models that focus wholly on academic theories of debt and gdp without taking account of the critical factor of QQE that respective governments such as the UK, US, Europe, Japan and elsewhere have been engaged in since at least early early 2009. This turns the economic world literally upside down whose primary consequences are contrary to what the academic models constantly imply that of deflation is always being imminent, instead the reality is the exact opposite, that QQE as I warned in July 2012 implies an acceleration in the respective Inflation Mega-trends as the price paid for effective debt cancellation. The government has to go through the pretence that QE is just temporary that at some point it will be unwound, and that monetized government debt still exists and will eventually be repaid, for anything other than having such an official view would result in a series of market panics for all financials denominated in sterling, because the market would discount the future, the market will make the consequences of future QE far more severe as they will discount it as pure monetization of government debt that the Bank of England aims to cancel. Therefore sterling would enter into a steep downtrend and inflation would soar, and not forgetting that technically officially canceling Britain's debt would make the Bank of England insolvent as a consequence of assets it holds ceasing to exist, and then what can of worms would that open up for Britain's financial system? Likely Britain's credit rating would fall to somewhere between that of Greece and Spain's. So if public debt is only about 40% of GDP instead of 75%, then why do all major political parties lie to the public ? Whilst the obvious reason is to hide the truth of money printing fraud and inflation consequences in terms of the risk of loss of confidence in fiat currency. However one of the primary reasons why the coalition government is perpetrating QQE through a myriad of smoke and mirrors is ideological, i.e. the Coalition Governments wants official debt to GDP to be high so that it can use it as an effective reason for dismantling Labours 6 million strong public sector gravy train and benefits culture pool of voters. Therefore, understand this that the debt is NOT the reason for the benefits and public spending cuts programme but Tory ideology aimed at making people responsible for their lives rather than sitting back on benefits whilst tax payers are forced to work ever harder so as to finance the life-styles of Britain's 5-6 million benefits scroungers. So the tories aim is to maintain the deficit and debt so as to erode the welfare state and reduce taxes on the workers. Whilst Labour uses high debt to gdp as an Keynesian excuse to expand the size of the economy through the public sector (implying debt to GDP will fall), therefore as soon as Labour gets elected then they tend to go on a spending spree to rebuild their vested interest public sector and benefits claiming voter pools and so the cycle repeats whilst each time debt and inflation gets ratcheted ever higher . So neither party wants total debt to shrink. Instead both parties (all parties) want to utilise debt to created vested interest voting blocks so that they can win elections. QQE allows the government to maintain its budget deficit as a % of GDP without impunity as more and more of the debt gets monetized, and that which I forecast to reach 40% of total debt by March 2016. As the government effectively has ceased to pay interest on that portion of national debt thus resulting in an effective lower Debt to GDP burden. However the fact still persists that the continuing deficit spending is not backed by any economic activity, and therefore it is just an increase in fiat currency in circulation that is chasing the same goods and services. Which means that each years annual deficit translates into another wave of money printing inflation, just as I I have been warning for over 4 years now and as illustrated at length by the Jan 2010 Inflation Mega-trend Ebook (FREE DOWNLOAD), that the only solution the governments have is to print money, no matter what they call it, be it loans, deficit spending, transfer payments, Quantitative Easing or printing debt (government bonds). This is the policy that ALL governments are engaged in that results in the debasement of ALL fiat currencies where all we witness in the exchange rates is the differing rates of free fall between currencies. Of course total government debt is actually over X4 higher then official public debt at about £4.8 trillion for 2012-13, as my earlier analysis of May 2009 forecast. And in addition to public debt and liabilities there is also private sector debt of banks, corporations and individuals that is estimated to be approx £7 trillion, given the fact that the bankrupt banks alone are still sitting on approx £3.5 trillion of debt, thus total UK debt is estimated to be at approx £12 trillion. 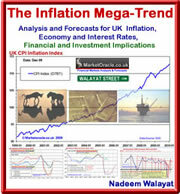 High UK Inflation for the past 4 years illustrates the tendency of the mainstream press to basically regurgitate the views of vested interests that have beaten the drum of always imminent DEFLATION for the whole of 2010 and 2011 as high inflation was always just temporary and should be ignored by the general population, which is the precise message that was still being bleated out by the mainstream press. The connection that the mainstream press has never been able to make is that the Bank of England does NOT make forecasts. Instead the Bank of England quarterly inflation forecast reports are nothing more than ECONOMIC PROPAGANDA, that virtually always converge towards the Bank of England achieving its 2% Inflation target in 2 years time, despite the fact that historical analysis shows that the Bank of England FAILS in achieving its 2% target 96% of the time, this is something that I have repeatedly exposed during the past 5 years following virtually every quarterly Inflation report. Because in the west when people lose their jobs, whilst the may cease producing, they however are still consuming i.e. food, travel, energy, and general consumption goes on, which are financed through debt, sale of assets and off course government payments. So whilst production reduces but in many respects consumption goes on resulting in INFLATION, because no matter what the governments call it they are effectively printing money to finance the ongoing consumption of the 8 million un-productive adults. Therefore the Deflation theories that forecast there MUST be deflation because of the destruction of Demand are ALL WRONG and so are their policy responses which are GUARANTEED to ignite higher Inflation. The bottom line is this that Governments need inflation to survive (buy votes), so they will never allow Deflation to persist and they have the money printing presses to ensure there will NEVER be a persistent trend for Deflation, which is why even Bankrupt economic meltdown Greece has had Inflation, as I wrote in the intro to the Inflation Mega-trend Ebook well 4 years ago (Free Download). The bottom line is that Britain rather than having a Debt Crisis instead has an INFLATION Crisis. As most people have been successfully brainwashed by relentless propaganda to believe that Inflation is good and deflation is bad. When the truth is the trend in inflation as a consequence of perpetually increasing debt is exponential. Whilst many academics focus on personal indebtedness as a driver for future house prices, however what they fail to comprehend is the fact that governments constantly seek to INFLATE the economy to perpetuate the illusion of growth that is represented by persistently high budget deficits i.e. governments spend money that the country does not have the consequences of which is to increase the velocity of money as people are effectively being forced to spend earnings and savings, else lose purchasing power as a consequence of INFLATION. The Conservative government's string of announcements most notable is the Help to Buy Scheme are aimed at inflating the housing market so as to engineer an debt fuelled economic boom as rising house prices encourages an INCREASE in housing market DEBT as home owners and buyers take on more mortgage DEBT. 1. The banks housing market bad debts become less bad and thus the banks are LESS bankrupt and more likely to create more debt / credit by the mechanism of fractional reserve banking. 2. Home owners who see the value of their assets rising month on month are for want of a better word deluded into SPENDING BORROWED money against the rising value of their houses, as they fall for the equity release sales pitch from the banks who encourage them to realise and SPEND the increase in equity they have in their home. However the reality of equity draw down is that it is a means of convincing Home Owning indebted SLAVES to BORROW EVEN MORE MONEY! Where the delusion is that the borrowers do not perceive it as an INCREASE in debt but instead a release of equity! The TRUTH is that rising house prices do not MAKE people richer, but instead more susceptible to BORROWING MORE Money for CONSUMPTION as people delude themselves that they can somehow spend money against a rise in house prices, but the reality is that they will service the NEW debt through FUTURE WAGES and nothing that is linked to the actual rise in house prices because to benefit from a rise in house prices they would need to realise it by either selling or generate an INCOME from the rise in house prices! i.e. by renting out their home or rooms so that it wholly covers the debt interest on the NEW debt and thus the income would need to be at a constant yield to rising house prices. That is how an home owner benefits from rising house prices. A step by step guide of how to buy a house. Also subscribe to our youtube channel for the video version of this analysis (parts 1&2) and the forecast. Your housing bull market analyst wishing you all a happy and prosperous new year. Hi Nadeem, Thought you and other readers may like to see the official explanation of QE recieved by me in an e mail correspondence with a BOE representative. "The money used for QE is created electronically as a positive balance on the accounts of the Bank of England, known as central bank money. This money is then lent, with interest charged, to the Bank of England Asset Purchase Facility Fund (BEAPFF) in order that the BEAPFF can then buy assets from the private sector. So far the BEAPFF has principally bought British Government Stocks from, for example, insurance companies and pension funds, as I wrote to you in 2011, it has specifically not bought stocks from banks. This part of the national debt still exists, it is just held temporarily by the BEAPFF. When the Bank decides that QE has done its job and we need to unwind the BEAPFF’s holdings in order to meet the inflation target, these can be sold back to the market and the electronically created money will disappear as the BEAPFF pays back the loan to the Bank of England. Meanwhile, dividends on these stock holdings are paid by the government to the BEAPFF as they are to any other holder of British Government Stocks. That is quite a contrast to a policy of ‘printing money’ in order to permanently extinguish the government’s debt, or in order to pay for current government spending. Indeed, it would be extremely unwise to pursue such a policy, since it could re-introduce all the problems of high and volatile inflation that the inflation targeting regime has sought to overcome." Quote ends. As you can see, they sternly deny any purchasing of government debt from banks, and deny any direct monetisation, repeating the sterilisation mantra of Bernanke and Draghi. They have never given any clue as to how they will conduct any "unwinding process".